Posted on May 1, 2018 at 6:09 am. We begin today with WOLF PACK PRIDE!! Thanks to all the students and staff who got into the spirit of Spirit Week and dressed as their “doppelganger” for Twin Day. You’re looking good, Williamsburg! 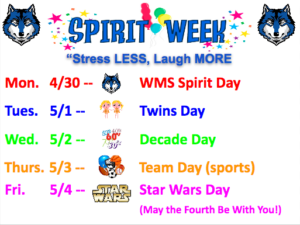 Now here’s the Spirit Week rundown for the rest of the week: Wednesday will be a blast-from-the-past with Decade Day; Thursday is for all our sports fans with Favorite Team Day; and finally, in honor of May the Fourth — next Friday is STAR WARS DAY!! So get into the school spirit, wolves, and BE A PART OF THE PRIDE!! And now, as part of Spirit Week and our “Stress Less, Laugh More” campaign — we’d like to welcome a Furry Friend to the WOLF-TV studio. For today’s Mindful Moment, WMS is going to the dogs! BOYERS: That’s right — TODAY ONLY during all grade-level lunches, Thunder and his Therapy Dog friends will be available to meet with students in the WMS Library. We’ll be bringing-up small groups from the cafeteria to socialize with the dogs — so make sure to eat quick and join the fun! I look forward to seeing you there — and I hope you have a stress-free week! Thanks, Ms. Boyers — and thank YOU Thunder! Be sure to join us tomorrow for the next Mindful Moment — when everyone can just slow down… and take a breath. –and Nora Nowicki, with the Candy Lover’s Basket. Winners may claim their prizes after school in the cafeteria. 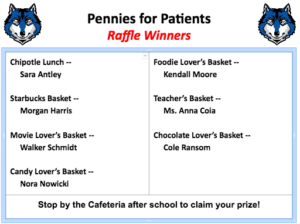 And a big thanks to everyone who participated in support of the Pennies for Patients fundraiser!! COLE: This just in to the WOLF-TV newsroom: The fairies are coming! THE FAIRIES ARE COMING!!! OK, then — thanks for that great reporting!! Back to business — The WMS Kindness Club will be meeting TODAY during ASP 1 in room 134. There are a ton of fun activities lined up for rest of the year — so you won’t want to miss it! And new member are always welcome. See Mr. Johnson, Ms. Schaefer or Ms. Zeller with any questions. All aboard! There’s a special “commuter” activity coming to WMS. TOMORROW from 10:15 to 1 o’clock, an ART bus will be parked outside of the main entrance. Students are invited to climb-on and explore this state-of-the-art bus, as well as purchase SmarTrip cards from the Mobile Commuter Store. Remember, students ride the ART bus for half price with an iRide card — and it’s a great way to get around. See Ms. Mays in the office with any questions.